The Thomas Rees Memorial Carillon is one of the largest and finest of the world’s carillons. Located in historic Washington Park, the Rees Carillon is the site of numerous free public concerts, exciting community events and the world-renowned International Carillon Festival and Festival Fireworks Display, held each June. Our Park District’s Carillonist plays a wide variety of classical, folk and popular music year-round. Enjoy the beauty of Washington Park and the Botanical Center with the unique accompaniment of carillon music. 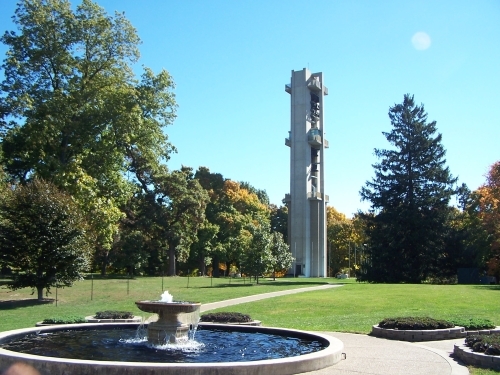 The Rees Carillon, a 12-story tower with three observation decks, offers spectacular views of Washington Park and Springfield from the city’s highest point of elevation. The beautiful 67 cast bronze bells range in weight from 22 pounds to 7½ tons! Enjoy an “insider’s view” of this extraordinary architectural landmark and rare musical instrument. Allow 30 minutes.